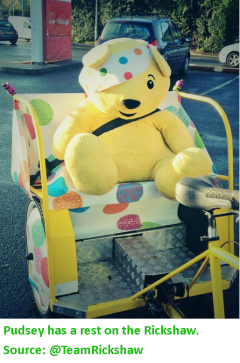 The BBC’s Rickshaw Challenge 2013 has climbed the equivalent height of Everest, raising money for Children in Need. Team Rickshaw have already pedalled 640 miles across Northern Ireland, Scotland, England and Wales as they make the final approach into London to complete their 700 mile journey. Supporters can follow Team Rickshaw’s progress on ViewRanger’s dynamically updated map – http://pudsey.viewranger.com – where the team’s tweets are also geotagged to their route. ViewRanger is used by outdoor enthusiasts worldwide. It provides mapping, navigation and a sophisticated sports computer, all fully integrated within an easy to use app. ViewRanger’s sports computer shows Team Rickshaw’s total elevation climbed stands at over 29,000 feet – the height of Mount Everest! 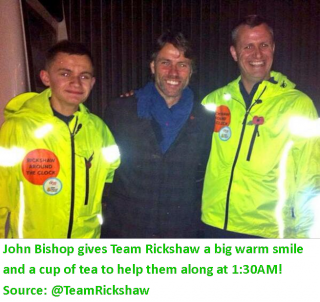 Reports from @TeamRickshaw say support this year has been fantastic as people line the street to cheer on the rickshaw, including pupils from Whittle-le-woods School, Holyhead Primary, as well as Jason Donovan, Amir Khan and John Bishop to name just a few! 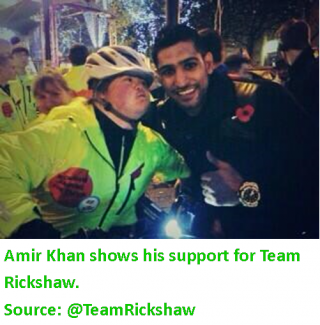 Team Rickshaw is made up of five young people, each of whom have been supported by projects funded by BBC Children in Need. The One Show’s Alex Jones and Rickshaw veteran Matt Baker will also be supporting the riders on their eight-day relay journey which takes in all four nations of the United Kingdom. The young riders are undertaking the challenge to raise as much money as possible to help other young people across the country. Every day viewers will be able to follow Team Rickshaw’s progress online at the Children in Need website and follow the team on Twitter via #TeamRickshaw, as they travel from Giant’s Causeway to London. To Donate £5, text “TEAM’ to 70705. Texts cost £5 plus one standard rate message, £5 will go to BBC Children in Need, registered charity number 802052 (England and Wales) SC039557 (Scotland). Go to bbc.co.uk/pudsey for full terms and conditions. You must be over 16 and ask the bill payer’s permission.